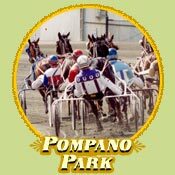 Pompano Park has been hosting world class racing since 1964. The park is currently being transformed into a state-of-the-art racetrack-casino, featuring live harness racing, poker, simulcasting, and slots. Construction is expected to be completed on the casino in 2007. • Exit at Atlantic Blvd. at go West. • Turn Left on Powerline Rd. • Turn Left at the 1st traffic light - SW 3rd St.